Individual billboards and the $40 billion marketing potential of Alexa – the next stage in the advertising revolution. The way we live is changing fast. Every fortnight in our Future Focus series, supported by Volkswagen, we’ll look at how one aspect of everyday life could change in the coming years. This week: advertising. IN A RELATIVELY short space of time – advertising has been revolutionised. Personalised ads are the norm online and even billboards are starting to get very intimate. It’s no big secret that your every move is being tracked online. Data is gathered on every click, scroll and swipe, with advertisers using that info to make ads more relevant and personal to consumers. The ability to hone in on potential customers online has been too good a prospect for advertisers to turn down, as shown by PwC’s online adspend study. In 2010, the study valued the Irish online ad market at €110 million and now it’s worth five times that amount. Spending on digital ads eclipsed television advertising for the first time in 2017. Super personal ads might seem like a foolproof idea in principle, but the new approach has backfired at times. Facebook has been one of the most popular websites used by advertisers, but it has been criticised for allowing so-called ‘fake news’ to be spread on its platform through online ads. Facebook has made noises about trying to stem the spread of misinformation through its ads platform, but the problem they’re attempting to solve is of a scale never seen before. “People are opting in to have a curated experience online, but I think personalisation is often used as an excuse to become almost stalking-like,” says Finian Murphy, a strategic planner at marketing company Core. Murphy notes that there is a lot of mistrust out there in online ads and if this persists, more and more people may start stumping up to pay for media – which will ultimately take eyes away from advertisers. “Look at streaming services, both video and audio, they are very much becoming mainstream now and it’s taking eyeballs and ears away from unpaid content that would be advertiser funded. This prospect why the industry is watching new products in the voice tech sector – like Amazon’s Alexa device and Google Home – with great interest. The voice tech space is a relatively untapped area so far for advertisers, but that’s about to change, according to Murphy. We’re keeping an eye on tracking the types of searches people are using voice for. Right now, people are asking to play their music or check the weather. People might start asking at category level next and ask where they can get clothing or washing detergent. So we’re keeping an eye on the role of voice and how we should be working with clients on voice search. Research by OC&C Strategy Consultants has predicted that voice shopping will balloon from the $2 billion industry it is today to $40 billion by 2022. It’s going to be a slice of the e-commerce pie that brands can’t afford to miss out on. A clear path for how ads will work on devices like Google Home and Alexa hasn’t been laid out, but it was reported Amazon has been talking to major brands, such as Procter & Gamble, about the company paying for their products to feature prominently in voice search results. That means when consumers say, “Alexa, I want to buy some nice hand soap”, the device might happen to suggest a few Procter & Gamble products first before listing everything available. This may sound like music to the ears of some. However, Murphy says advertisers shouldn’t jump the gun and get too excited about voice tech as a foolproof new way to reach consumers quite yet. The rate of change in voice tech and how quickly adverts permeate the likes of Alexa and Google Home will be largely dependent on artificial intelligence. Murphy says he’s skeptical about how advanced this sort of tech is right now and thinks advertising still requires a human touch – which robots haven’t quite mastered. “There are constant conversations about artificial intelligence, from robots to programmatic buying of ads, but a key focus we would have is how human intelligence and emotional analysis of what’s going on with numbers and data is really important. That’s particularly important when you start looking at how people start connecting on an emotional level with brands and companies. A lot of mistakes can be made relying purely on the numbers and not actually understanding the nuances and qualitative side of a relationship people might have. We’re not there with artificial intelligence yet that we can read into how people feel about something being advertised. For more futuristic advertising trends, Netflix show Black Mirror might be able to give us a chillingly accurate peek into the not-too-distant future. The dystopian series features personalised billboards – which change based on who is viewing them – and screens that track whether your eyes are actually watching an advert as it plays. The basis for this technology is not as far-fetched as you might imagine. The famous billboard in London’s Piccadilly Circus, for example, is already tracking who is watching. Built-in cameras are used to monitor people nearby and even track the age demographic. Then ads are selected for the billboard based on who is within eyeshot. The cameras can even detect what kind of cars are in the area so ads can be tailored specifically to certain motorists. 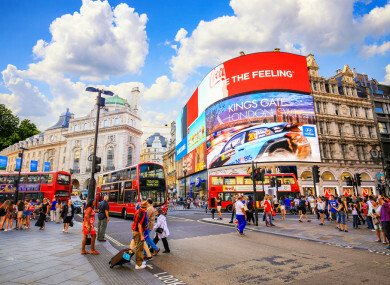 Even though rapid advances in technology have made personalised billboards a reality, Murphy says the advertising industry isn’t expecting another super futuristic revolution in the coming years. It’s all about incremental change. Email “'Did you see that billboard, or was it just me': The personalised future of advertising”. Feedback on “'Did you see that billboard, or was it just me': The personalised future of advertising”.